A minister from southwest Iowa is among the first in the world to receive a newly-configured type of pacemaker during a recent operation at an Omaha hospital. 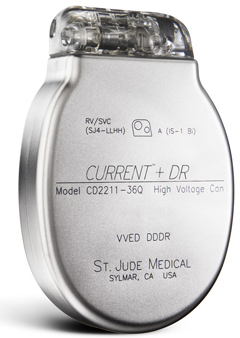 The device is called an I-C-D, for implantable cardioverter defibrillator. Dr. John Scherschel, a cardiologist at the University of Nebraska Medical Center, says it was a thrill to be working with the developing technology. “The devices are a little bit smaller than a deck of cards,” Dr. Scherschel says. “We think of them as slightly larger than a Zippo lighter.” The surgery was performed July 30th on Eddie Fidler, a 75-year-old from Clarinda. He is pastor of the Church of God in Clarinda. Scherschel says the newly-built device minimizes the number of connections between cardiac leads and the I-C-D.
Scherschel says, “We use three connections with four set screws to connect to four conductors through a single lead and the new technology is to use a single set screw and a single pin to hold all of these connectors together.” He says this is a “significant breakthrough” in the field. The device is similar to a pacemaker, but with a key difference. Pacemakers are usually chosen to correct a heart rhythm that’s too slow, while I-C-Ds are used to correct a heart rhythm that’s too fast. As for the patient, Pastor Fidler, Scherschel says he recovered quickly. “He is doing quite well,” Scherschel says. “He saw one of my partners in follow-up and he was getting back to his normal activities a week after the procedure and just had a couple of days of down time, of feeling kinda’ sore.” The new type of I-C-D connector system is called S-J-4. It was approved by the F.D.A. in April and first implanted in a patient in June. It’s only been available for use at a limited number of medical centers nationwide. Once the device is in place, it runs on batteries for up to seven years. The batteries don’t conk out unexpectedly, as physicians can detect when the battery is running low during a routine office visit.